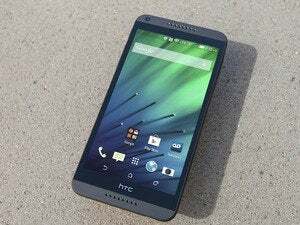 Maybe it’s the name, but I expected HTC’s Desire Eye to be less expensive. 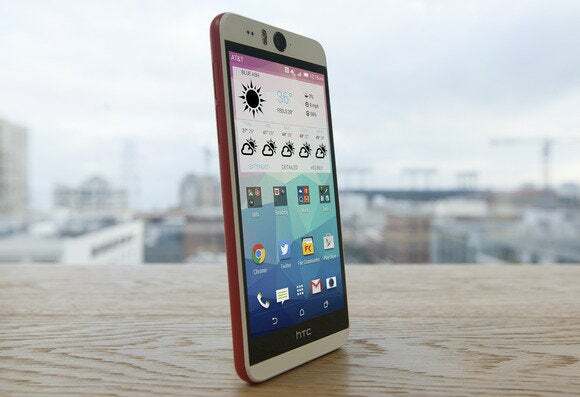 “Desire,” after all, is the name HTC usually reserves for its mid-range phones, and the Desire Eye, with its plastic chassis and boxy frame, seems like it would fit right in. Yet AT&T is currently charging $150 on-contract for the Desire Eye—just $50 less than flagship phones like the HTC One (M8)—or $550 off contract. The Desire Eye isn’t a bad phone, even at that price, and its 13-megapixel front-facing camera is a unique feature. But overall, it’s a tough sell when better handsets can be yours for just a little more. HTC makes liberal use of plastic on the Desire Eye, but in a way that seems playful rather than utilitarian. The front bezels and rear panels are white polycarbonate, as opposed to the glossy plastic found on cheaper phones, while red trim runs around the edges. That color accent carries over to the software, appearing in HTC’s BlinkFeed news ticker and in various buttons and icons. 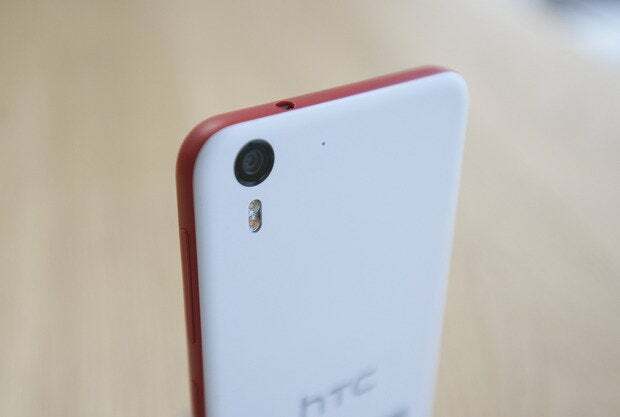 But while HTC offers the Desire Eye in dark blue with light blue trim in other markets, red is the only option on AT&T. The red-on-white color scheme is your only option through AT&T. The other downside is that the Desire Eye feels chunkier than other large Android phones, even if its 0.33-inch frame is in the same ballpark. That’s because there’s no tapering around the edges to help you cradle the phone in your hand. HTC didn’t cut many corners in the specs department. The Desire Eye uses the same 2.3 GHz Qualcomm Snapdragon 801 processor and 2 GB of RAM as the One (M8), making for smooth animations and no noticeable problems with 3D games like Asphalt 8. The phone also comes with 16 GB of storage and a microSD card slot. The 1080p display doesn’t feel skimpy, either. Some other phones have pushed resolution higher, but it’s tough to make out any individual pixels on the Desire Eye’s 5.2-inch display. If I had to nitpick, I’d say that black levels don’t get as deep as they could. HTC didn’t skimp on the Desire Eye’s display. HTC did shave a bit off the Desire Eye’s battery compared to the One (M8), with a 2,400 mAh battery instead of 2,600 mAh. It showed in our video playback test, as the Desire Eye lasted 9 hours and 30 minutes—a half-hour less than the One (M8) and an hour and 15 minutes less than the Samsung Galaxy S5. To get you out of any low-battery jams, HTC provides a power saver mode that limits CPU usage and brightness while disabling vibrations and standby data use, and there’s also an extreme power saver mode that limits the phone to just a handful of vital functions. Like most Android phones with custom interfaces on top, the Desire Eye ships with the slightly-outdated Android 4.4 KitKat. 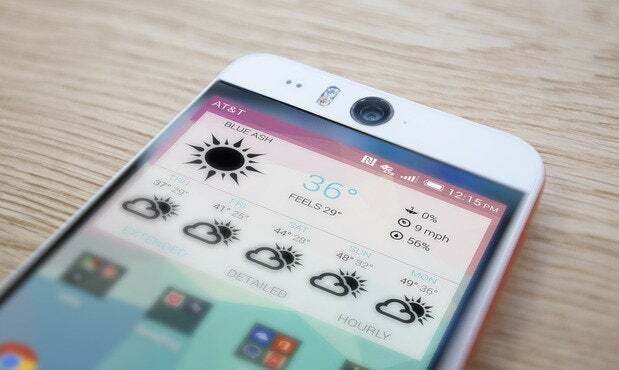 The good news is that HTC’s Sense overlay is among the better customizations you’ll find, with an understated look that doesn’t pester you with cartoonish beeps and bloops. You do have to ignore a few superfluous HTC apps, though, including a notepad that’s not as good as Google Keep , and the Zoe photo remix sharing app that has zero chance of catching on. As for an update to Android 5.0 Lollipop, there’s no official word from HTC yet, though the company has a strong track record, and we’re looking at a January to March timeframe according to an unconfirmed report. The cameras—note the plural form—are supposed to be the Desire Eye’s headlining feature, with 13-megapixel shooters and flash on both the back and front. But the numbers don’t tell the whole story, and the Desire Eye’s cameras come up short in some areas where they should shine. In medium to well-lit situations, the Desire Eye’s rear-facing camera does a fine job. Colors can run on the warm side, but that’s not always a bad thing, as I found the Desire Eye’s more vibrant tones preferable to the iPhone 6 Plus’ camera in certain photos, even if they weren’t as true to reality. Low lighting is a different story. Despite an f/2.0 aperture that lets plenty of light in, I struggled to take photos that weren’t too blurry to discard. 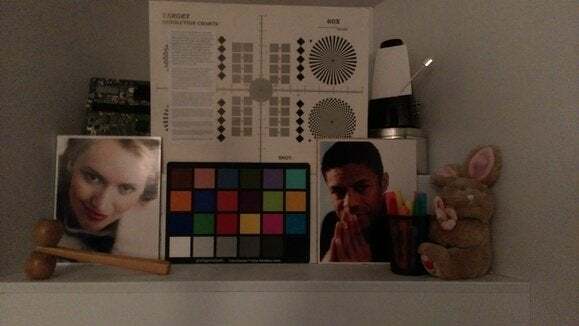 ... but low-light photography can be hazy and blurry without flash. My feelings about the Desire Eye’s selfie cam are similarly mixed. You won’t find another front-facing camera that captures this much detail, as every pore and eyelash can be held up to close scrutiny, and the wide-angle lens can comfortably fit at least three people in the frame at arm’s length. But on the front camera, the color reproduction problems are even more pronounced. Sometimes the camera made my skin pale while accentuating redness on my cheeks and lips. Other times, it gave me an unnaturally green hue, and in low light it bathed me in too much shadow. Flash can help compensate in some of these situations, but the result rarely looks natural. 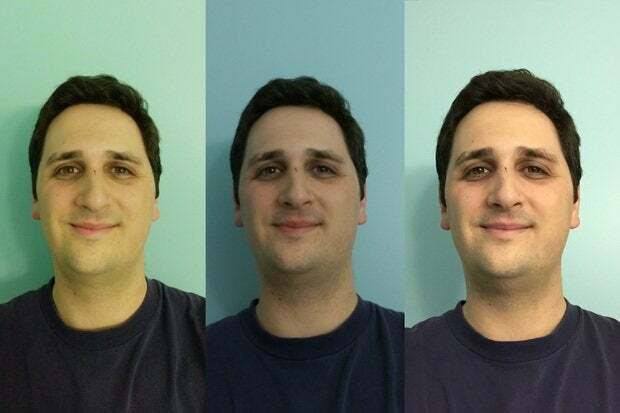 HTC Desire Eye front camera (left) and rear camera (center) vs. iPhone 6 Plus front camera (right). At least HTC’s camera software is top-notch. For selfies, you can have the shutter activate by voice, automatically snap photos when everyone’s smiling or create a “photo booth” image of several sequential photos. Camera settings are easily available along the left side of the screen, and if you snap burst photos by holding down the shutter button, you can then pick the best one and automatically discard the rest. My only complaint is the shortage of tools in the built-in editor—even basic lighting and contrast controls are missing—but this is easily solved with third-party apps like Aviary. 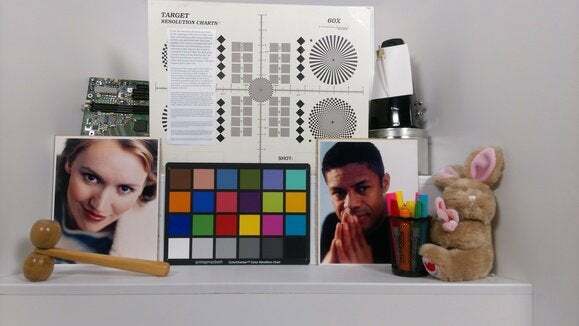 If the Desire Eye was more successful on the photography front, its $150 price tag might be easier to justify. I might have even called it a bargain next to HTC’s flagship One (M8), with small compromises in design and battery life. Instead, the Desire Eye’s rear camera lacks the low-light chops of the One (M8), LG G3, and iPhone 6, and the selfie cam’s color issues cancel out the benefits of its high megapixel count. HTC's selfie phone is only slightly less expensive than the flagship One (M8), but the gulf in quality is greater.